We had high hopes for Fallout’s first foray into iOS gaming, but this resource management game suffers for its repetitive gameplay and slow pacing. 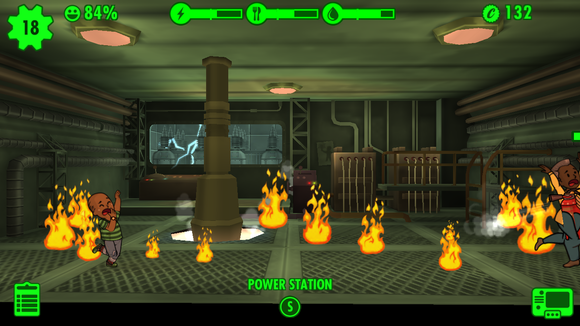 In the wake of Bethesda’s Fallout 4 announcement at E3 2015 on Sunday, the developer surprised fans by releasing its very first iOS game: Fallout Shelter. Even more exciting was that it launched the same day as the announcement—players could download and start grinding away at this resource management game right away, while waiting for Fallout 4 to launch this upcoming November. In Fallout Shelter, you play as an Observer, controlling a virtual ant farm or “vault” that contains a growing number of dwellers. 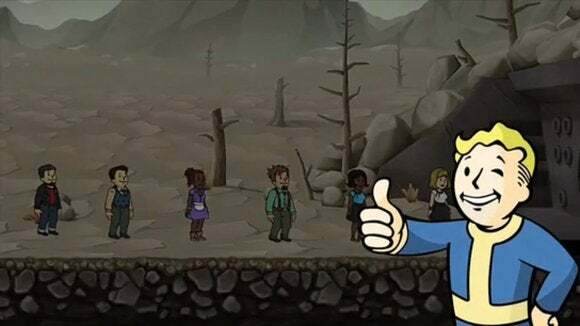 Your dwellers all resemble Fallout’s iconic mascot “Vault Boy,” and have similarly 1950s-esque boundless enthusiasm for their tasks… despite living in a post-apocalyptic bunker. Premise aside, Fallout Shelter gives us a very different take on the Fallout universe. While the Fallout series has evolved into a hybrid role-playing game/shooter, Fallout Shelter narrows its focus to resource management. You’ll need electricity to power your various structures, water to prevent irradiation, and food to keep your dwellers from starving. These initial structures can be upgraded or expanded and are later joined by more specialized buildings like radio stations, armories, and medical bays. Your structures can be expanded and upgraded, but need elevator access. 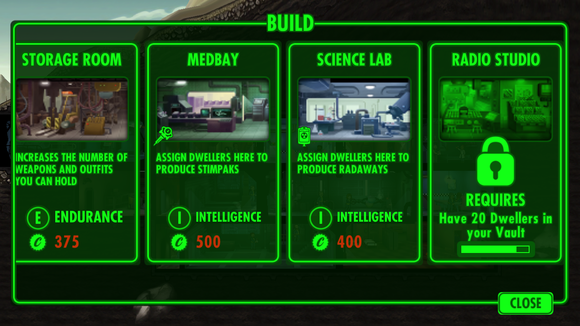 Like any good virtual ant farm, your dwellers each have stats that make them better at certain jobs than others. Someone who has high intelligence, for example, will do well in one of the science labs but will likely be unhappy serving food. 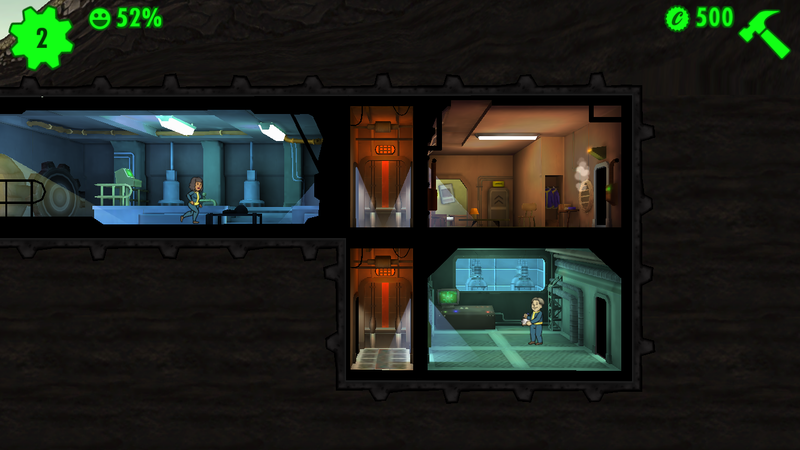 Expanding your vault means expanding your population, which was the major bottleneck for gameplay. Sometimes people will wander in from outside (even with the radio station, I found this to be rare). But usually, you’ll have to do it the old-fashioned way: By putting dwellers of opposite genders in the same living quarters and waiting for something, ahem, major to happen. Watch your dwellers flirt and produce new dwellers! It’s the circle of life! 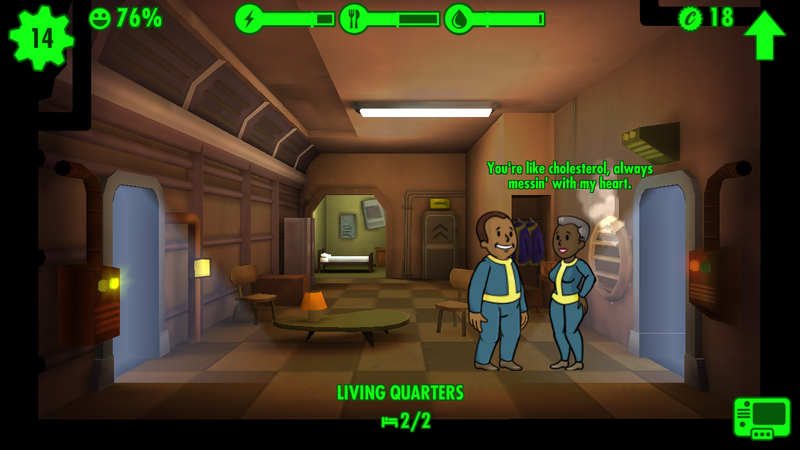 If the dwellers have high enough charisma, they’ll produce children. It’s easily one of the cleverest aspects of the game and one of the rare instances where Fallout Shelter seems to offer something new to the mobile ant farm simulation genre. The drawback is that increasing your population is difficult and time-consuming: I had to think way too hard to figure out who had bred with who already (thankfully, the characters will tell you when they’re hanging out with family, and therefore won’t be romantically interested in the person). As your population grows, so do your building options. With only a few structures to purchase initially and the slow growth of your population, Fallout Shelter builds slowly. To spice things up, the game has sporadic emergencies. Emergencies occur when you try to “rush” one of your structures to produce its output sooner. If you succeed, your dwellers get an experience point bonus and more of the in-game cap currency. If you fail, you might have a fire or a radroach invasion on your hands. Rushing a job comes with an inherent risk of disaster. Succeeding in certain missions will get you access to lunchboxes that will have weapons, costumes, and additional currency. These weapons and costumes can be given to your dwellers to boost their stats and help fend off raiders. Of course, it wouldn’t be a Fallout game without raiders brandishing makeshift weaponry. While you can assign weapons and costumes to any dweller, I usually kept them unassigned until a raid happened and then quickly equipped whoever was closest. Most of these raids are a nuisance rather than a threat—if you have weaponry, you’ll likely be able to fight them off. But you can only deploy a couple of dwellers per room, so if you have raiders crowding into your power plant, you have to micromanage who goes into the breach and takes them on. It’s a clunky, often frustrating mechanic. Similarly, while sending one of your dwellers to go explore the wasteland and find new equipment is a great idea in theory, you’ll have to monitor their endurance and running log pretty closely—their battles all happen off screen and if you don’t pay attention, you’ll return to the game and find your explorer has died (resurrecting them is somewhat costly). While the art aesthetic is beautiful and quirky, and the dark humor is true to the spirit of the series, Fallout Shelter suffers for its repetitive gameplay and slow pacing. With Tiny Tower and its ilk, you eventually got bored of the adorable artwork, daily quests, and the grind of collecting resources. Fallout Shelter, despite some dashes of chaos, is too slow and taxes the most important resource of all: Your patience. As a freemium game, maybe this flavor of ant farm is what you’ve been craving, but don’t expect for this to have much of a half-life.